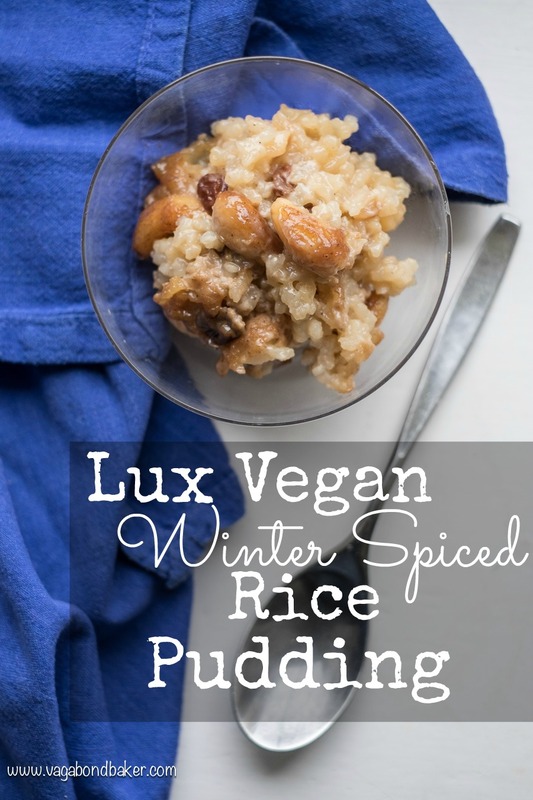 Lux Vegan Winter Spiced Rice Pudding. When the winter nights draw in all I want is comforting delicious food: rice pudding is never far from my mind. 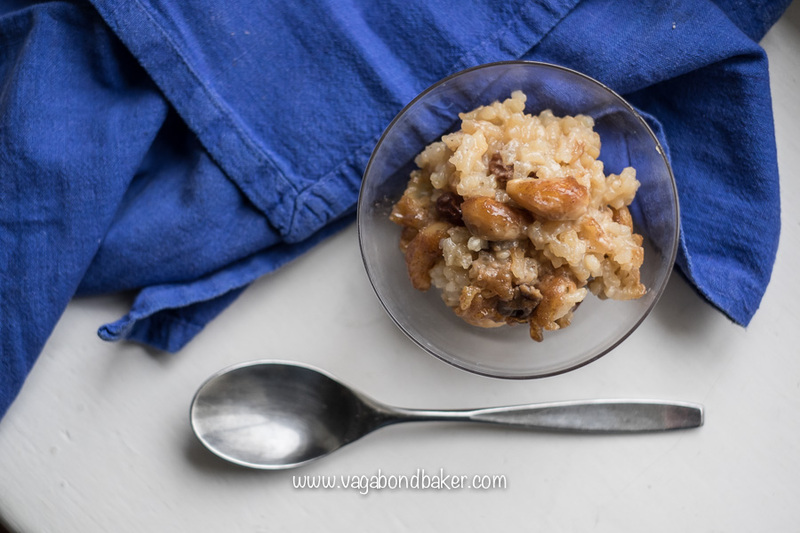 And this recipe I have for you today is the most delicious rice pudding I’ve ever made, and believe you me: I’ve made a few! As I prefer, this is a baked rice pudding. So easy and no fuss: the oven does all the hard work while you can get on with your day. This is a slow recipe but the actual manual work is mere moments. 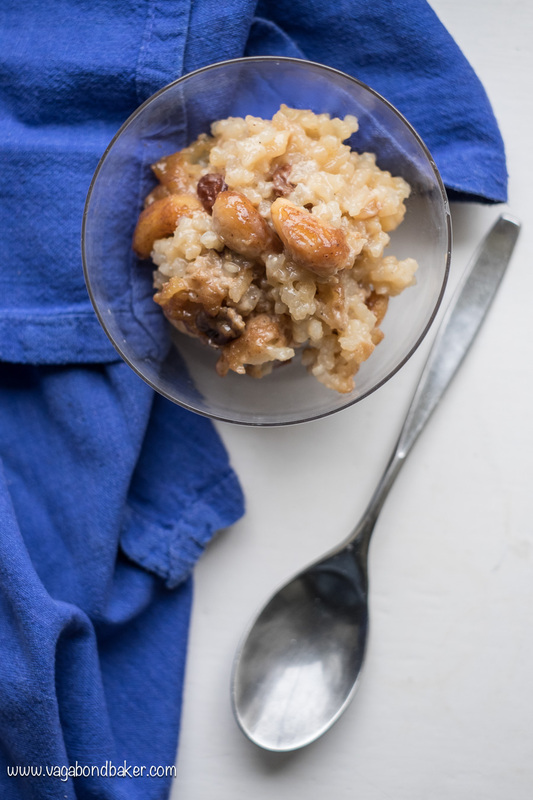 There is already a spiced rice pudding here on this blog (paired with roasted rhubarb! ), and I’ve improved on that recipe and at the same time converted it to vegan. 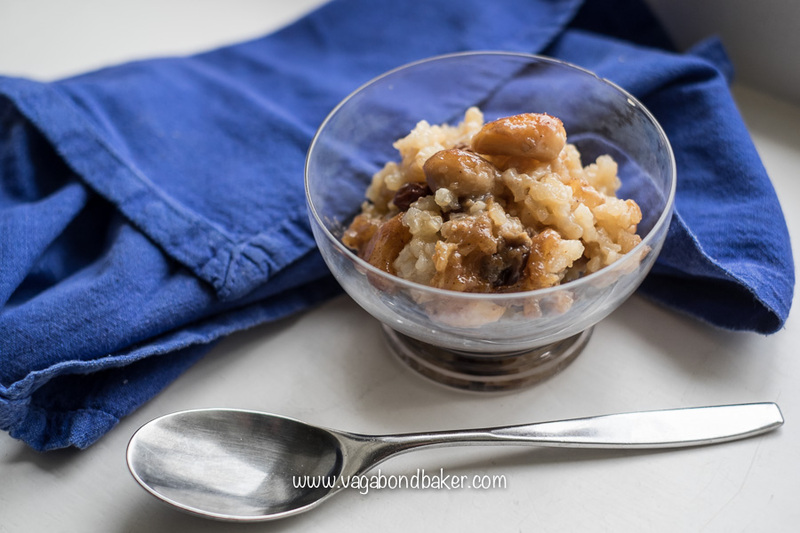 You really wouldn’t know this Lux Winter Spiced Rice Pudding is vegan : it’s luxurious, jewelled with plump sultanas and cashews. The cashews swell in the oven to a lovely softened texture and the rice takes on the spice-infused almond milk: heady with clementine peel, star anise and fresh ginger. This is a dish that you keep going back to; I can’t leave it alone, it is just that delicious and moreish. This rice pudding certainly helped to cheer me too, it is effortless to make and packed with restorative goodness. It makes a fabulous dessert, however I rather enjoy it for a lux breakfast too! 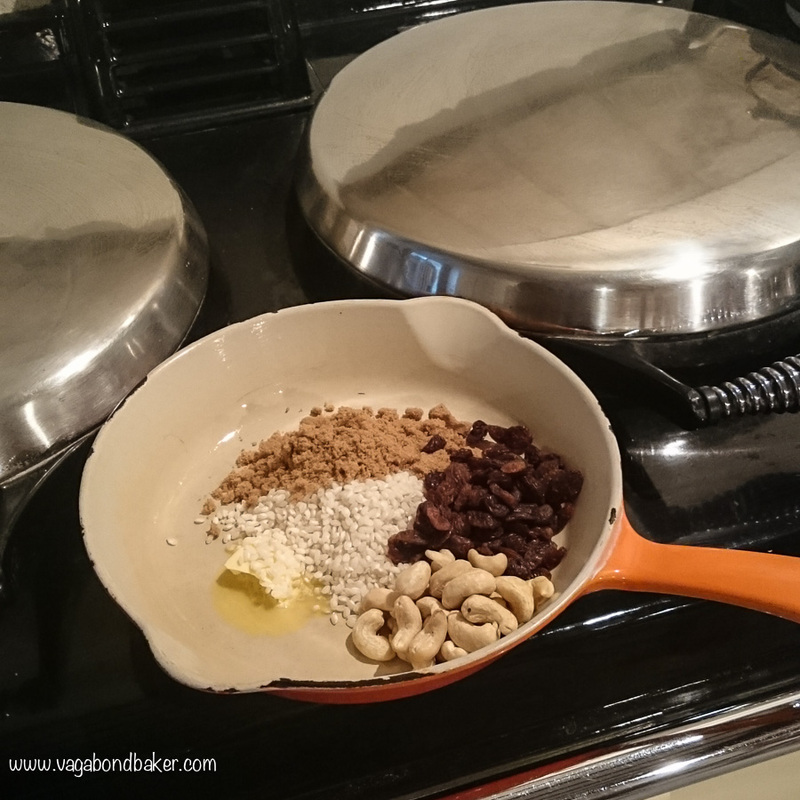 Simply place all of the ingredients into a pan and put on a low heat until fairly hot. Do not let it boil though. Take off the heat and let the spices steep for around half an hour, cover the pan with a lid or a plate and stand to one side. Oven 220 C / gas 7 / 425 F / Aga roasting oven, rack on first set of runners from the bottom then drop oven to 140 C / gas 1 / 275 F / switch to Aga simmering oven. You need a shallow two pint oven-proof dish, greased with a little vegan margarine. Place all of the ingredients into the greased oven-proof dish and give it a gentle stir. Carefully put it into the hot oven and bake for 20 minutes. At this point lower the temperature of the oven to 140 C / gas 1 / 275 F or if you are using an Aga, switch the pudding into the simmering oven. Set a timer for an hour and a half and leave it to slowly bake. You can forget about it! After that hour and a half, test the rice, it should be soft without a bite. If not return it to the oven and cook for longer. Keep your eye on it now though, over-cooking will make it dry and stodgy. So long as the rice is cooked don’t worry if it seems to runny, the pudding will thicken somewhat on standing. A luxurious rice pudding made with almond milk and spices, jewelled with cashews and juicy sultanas. 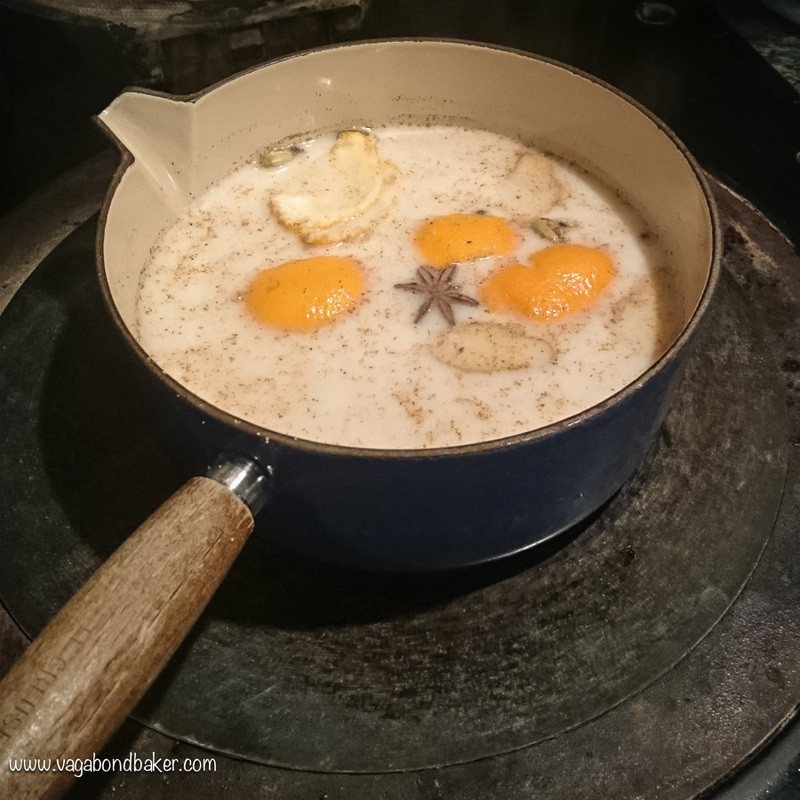 Simply place the almond milk, spices and clementine peel into a pan and put on a low heat until fairly hot. Do not let it boil though. Once steeped, strain through a sieve. The spiced almond milk is now ready to use. 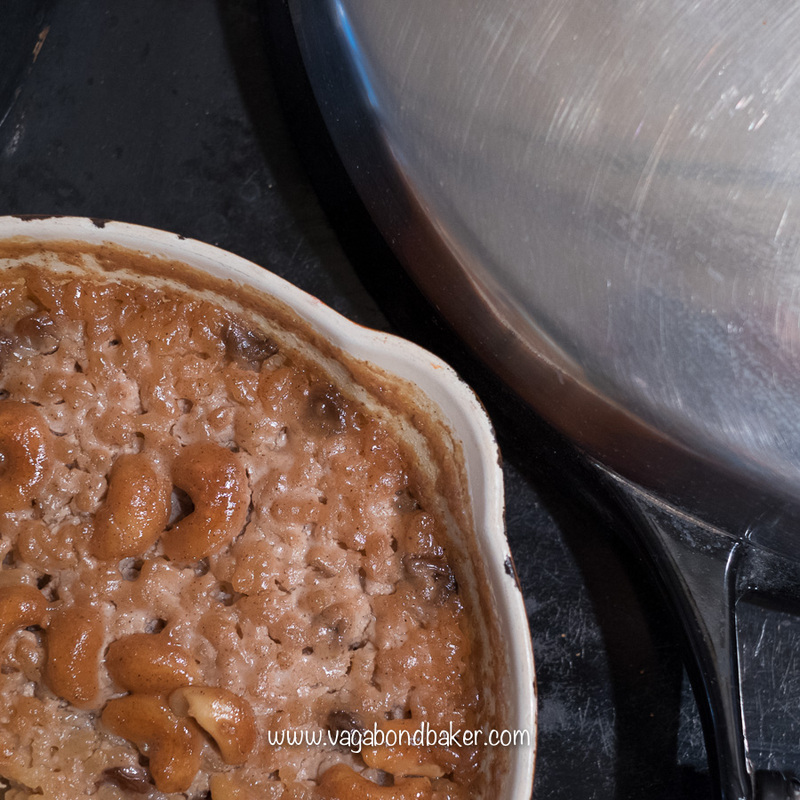 Preheat oven to 220º C/ 425º F.
Place the sugar, vegan margarine, pudding rice, sugar, cashews, sultanas and all of the spiced almond milk into the greased oven-proof dish and give it a gentle stir. At this point lower the temperature of the oven to 140º C / 275º F .
Serves 4, can be served warm or cold from the fridge. Vegan Spiked Mince Pies These tarts that should add some festive cheer! 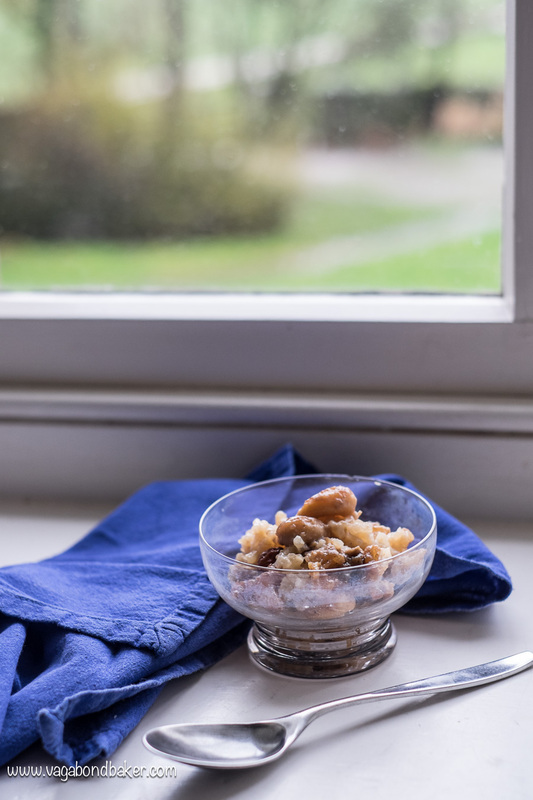 Plum And Almond Cobbler a delicious and hearty winter dessert, it’s vegan too! Deliciously Vegan Swedish Cinnamon Rolls Coils of Scandinavian wonder! Spiced Rice Pudding With Roasted Rhubarb A beautifully summery rice pudding. 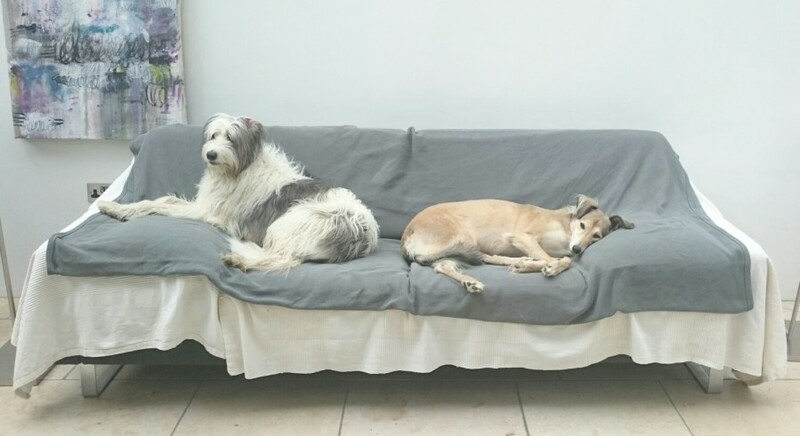 A Day In The Life Of A House Sitter! Fun and cute, made like an 80’s photo comic strip! What food do you crave in these dark winter days? This sounds so delicious! I was just thinking about making rice pudding the other day and now it seems like I have no choice because this just looks so amazing. Do make it Meghan, it’s so delicious! Let me know how it goes!